There are two things that frustrate me the most about Facebook. The first is how games work there. I love the way Lexulous worked. I was playing games with my friends, and I was playing games with strangers without having to friend them first. And because it wasn’t constant asking me to invite people or ask them for help, I actually posted wins and achievement notices to my feed. Of course, Words with Friends owns my soul now, so I don’t play much Lexulous anymore. (Hint: people like to play on their phones and you phone app sucked. Maybe it has gotten better, I don’t know, because I’m not there anymore.) I want to play other games, and being a huge fan of MMOs I don’t mind playing with other people. But the current design of most (Zynga) games is that I need dozens and dozens of friends playing in order to progress at a reasonable level. Well, I don’t have that many real friends who want to play, so I need to friend strangers unless I want to suffer slow play. Friending strangers breaks Facebook. The result is, occasionally a game interests me enough that I’ll create a group/list that I’ve painstakingly denied all access to, and friend random people and put them in that list. This lasts until either a) I need even more friends, or b) I get a creepy feeling from having all these non-friend friends and thinking I missed some setting and they have full access to all my stuff. Then I spend a day purging those people and those games from my account. 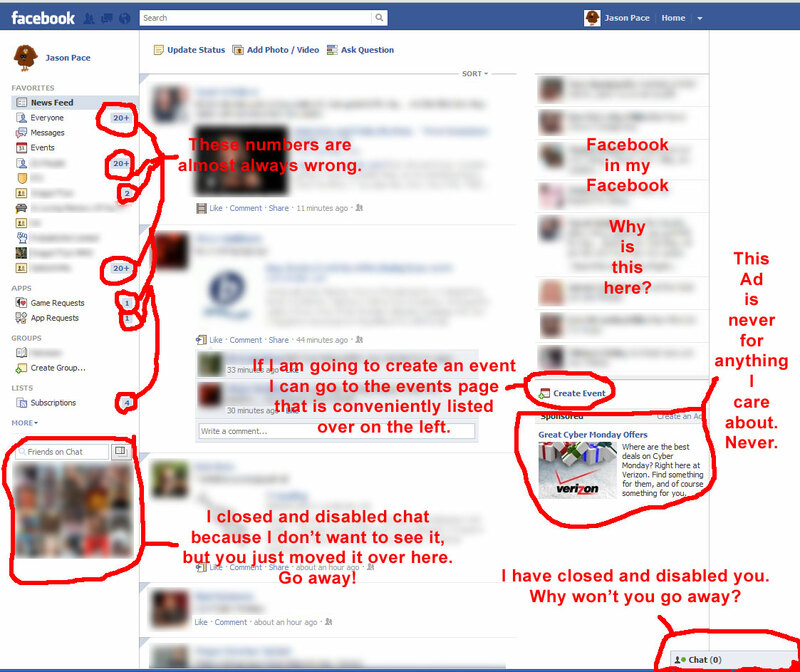 That covers pretty much all that I find annoying or crappy about the default screen I get to see when I log in to Facebook. Essentially, the content I want is surrounded by stuff that is wrong or pointless. And they go a step further by making that center column all wrong. I want a time line, in order, of stuff my friends have done. That group on the left side called “Everyone” is how I do that. Even though the default News Feed lets me choose to show news with “recent stories first”, that feed and my “Everyone” feed are different, and not just because my own updates don’t appear in “Everyone” but because there is still stuff missing from the default feed. Speaking of the default feed is constantly telling me things like that there are “5 new feed items” and then I click the link and only 2 items show up, or that one time it said I had 10 new items and none showed up when I clicked the link. I realize that’s probably because of all the apps I’ve blocked, but if I’ve blocked them then why are you telling me about updates I can’t see? And that goes hand in hand with my complaint about the numbers on the left. It tells me where are 20+ updates in a group, and I click on it to see that there are only 5 updates because there were probably 15+ messages from apps I’ve blocked. Stop with the grouping already! To add insult to injury, even though Facebook allows me to sort the default news feed by most recent, it constantly randomly resets to the useless default Highlighted Stories First format.